Chef Teresa Montaño on Sergio Ramos, seasonality, and the perfect paella. Highland Park is the perfect backdrop to Teresa Montaño’s love letter to Valencia, Otono. "Highland Park is old LA so there is a very rich Hispanic community here," she told Citizine. "Despite the current gentrification of this neighborhood, the Hispanic culture remains a stronghold which is my favorite part about it, it reminds me of home." For her, home is New Mexico where she fell in love with food at the parties her grandmother used to throw. Food wasn't her first love though -- that title goes to soccer, which she pursued as a Division 1 player at Pepperdine University. "I think it's why I've taken to this career," Teresa said. "100% for sure my background as an athlete and competitor has informed my career in the kitchen. The physicality, the intensity, the thinking on your toes, teamwork, grit and pressure are much like being on a soccer field. I love it! I think it was Dan Barber that said, 'I believe strongly that good cooking is physical, it demands a certain kind of conditioning.' I totally feel that!" She even wanted to name a cocktail after her favorite player, Sergio Ramos. Otoño has opened in good company, with some of Teresa's other favorite Highland Park spots like Triple Beam Pizza, Rosty, and El Huarache Azteca just down the street. "The mix of old and new is exciting, I embrace both," she added. 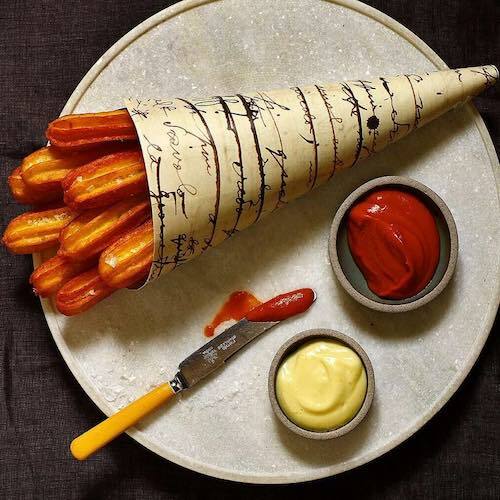 With Otoño, she's brought her take on Spanish tapas filtered through a Los Angeles lens to Figueroa, with a menu that includes classics like gambas a la plantxa and a reinterpretation of patatas bravas into churros. 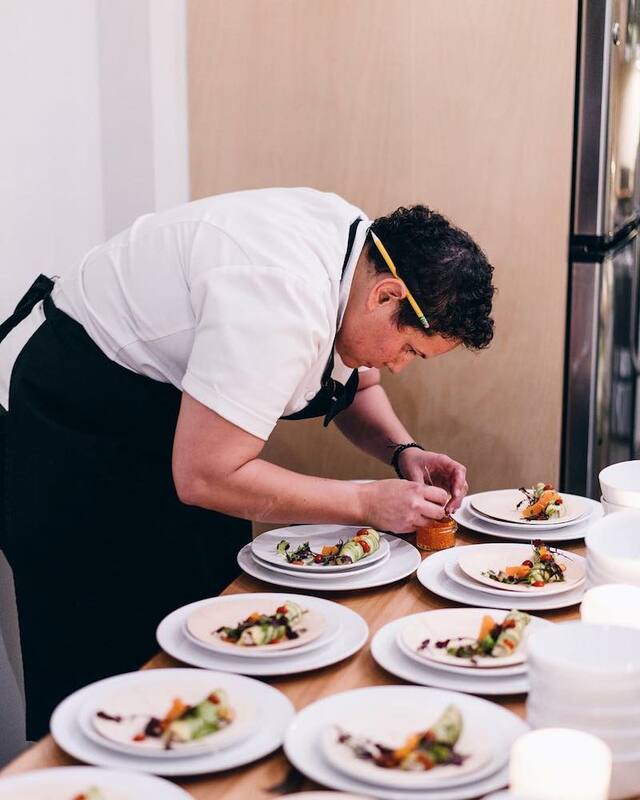 "I built a repertoire at Racion of techniques, ideas and recipes that I use as a base for my menu here at Otoño," Teresa continued. "I often start with the ingredient or a classic dish I want to play with and the concept builds from there. Quality of ingredients is so important to me and certainly a focus of the menu concept. Because so much of Spanish food is so simple the ingredients really have to take center stage. I obsess over seasonality and I get bored too so the menu will constantly be changing and always reflect the season." 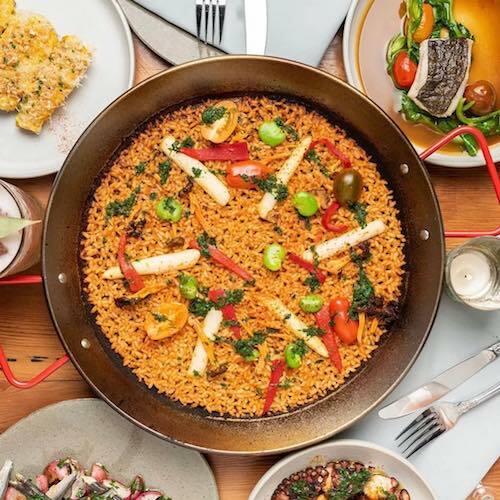 Some of her other favorite items on the menu are croquetas, with a classic jamon serrano, elote with a Spanish twist, the vaca vieja with black garlic and beef fat potatoes, and of course, the paella. "The paella has been fun to conceptualize and explore," Teresa told Citizine. "Finding the right rice, the right liquid to rice ratios, cook time etc. It's tricky to pick up in a restaurant which I assume is why there are not more people doing it." For her, it all comes back to the focus on ingredients. "We use bomba rice, this rice has a lot of surface area, the grains are like little sponges," she continued. "All of the flavor of a paella, in my opinion is a combination of the sofrito and the stock packing into those little sponges and then achieving the socarrat crispy goodness on the bottom of the pan. When I was thinking through our recipes, I thought a lot about stocks and broths, I thought about my favorite broths like dashi and ramen broths. I landed on a bouillabaisse type stock for our paella de mariscos that has aromatics of star anis, saffron, and fennel, for me this is both classic but gives the paella more dimensions and modernizes it a little. We use dashi in our paella negra and we add a little miso to our vegetable stock for umami and nuance. It's really all about the broth! The sofrito we use is called salmorra, it's a tomato, ñora chile and garlic paste, this also gives the paella more layers and seasons the rice. There seems to be a whole world of paella to explore if you think about it from a broth standpoint." "Certainly have a paella and explore the wine menu," Teresa continued. "Our wine director Katie Putterlik did a brilliant job pairing with our food, every bottle is a hit!" 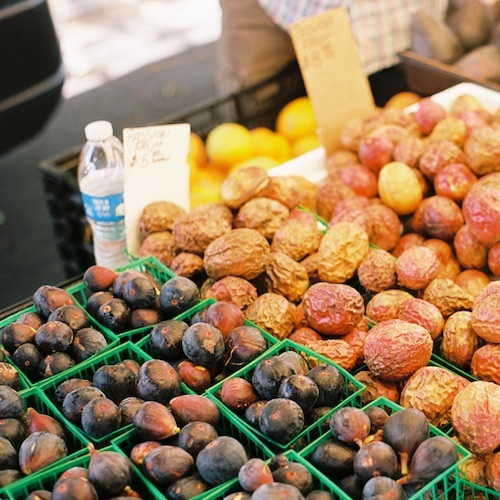 Every Tuesday, the Highland Park Farmers' Market pops up on Ave. 58, just around the corner from Otono. "It's still small," Teresa noted. "But the produce is good and we need to get more people out here." 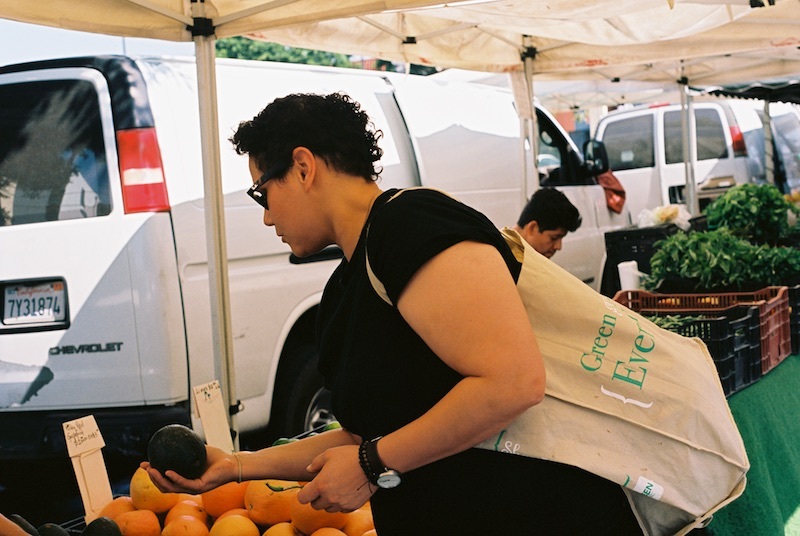 She tasted papalo, a Mexican herb that is reminiscent of arugula, cilantro, and rue, from Angel Farms and picked up some in-season squash blossoms as well. Next was Aceved Farms, for their sweet nectarines and larger than your hand avocados. On the way back to the restaurant to open for happy hour, she repeated her if you build it they will come sentiment, promising to return the next week. 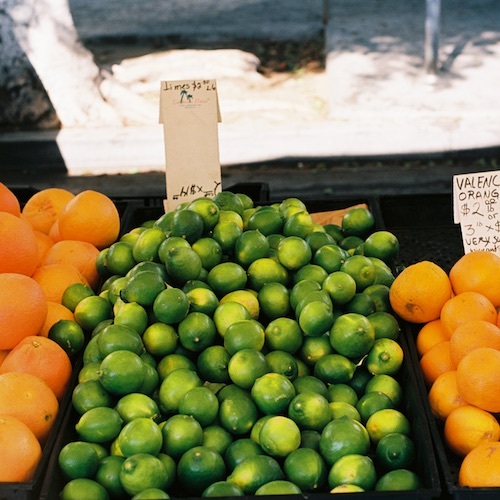 Outdoor farmer's market open Tuesdays only, hosting produce, prepared food & craft vendors. Otoño is a progressive Spanish-inspired restaurant concept exploring tapas and paella beyond tradition and through a modern, urban lens. Savvy commuters to the LA Metro Gold Line to Highland Park Station which is adjacent to Otoño and Frank's Camera Building.